Born in 1983 Saku city,NAGANO. Graduated from Osakaseikei univercity art course in 2008. 2008-present, live and work in Saku city，NAGANO. A plane work is mainly drawn. 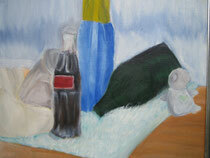 Oil paintings, Acrylics,Water color,pen and ink,etc. A subject is decided in the form which reaches to an extreme of the newness of its inside. I like sleeping while listening music.